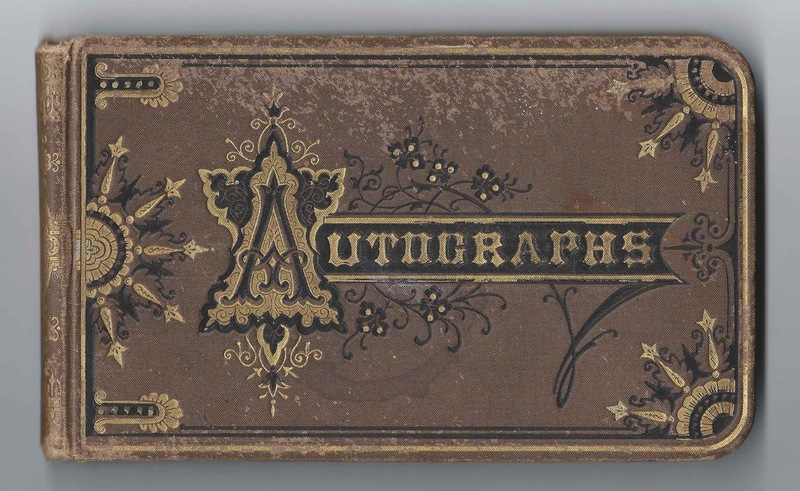 1870s autograph album of Clement Adams Walker, Jr., of Boston, Massachusetts, received at Christmas 1875 and kept possibly while Clement was attending Boston Latin School. He may have been a member of the class of 1879. The album measures approximately 7" x 4-1/4" and contains the sentiments of 31 of Clement's relatives, friends and schoolmates. An alphabetical list of the signers, with any residence or school information, appears at the end of this list. Clement Adams Walker, Jr., was born 22 September 1862 at Boston, Massachusetts, the son of Dr. Clement Adams Walker, Sr., and Georgiana (Nichols) Walker, who were born at Fryeburg, Maine, and Black Rock, Connecticut, respectively. 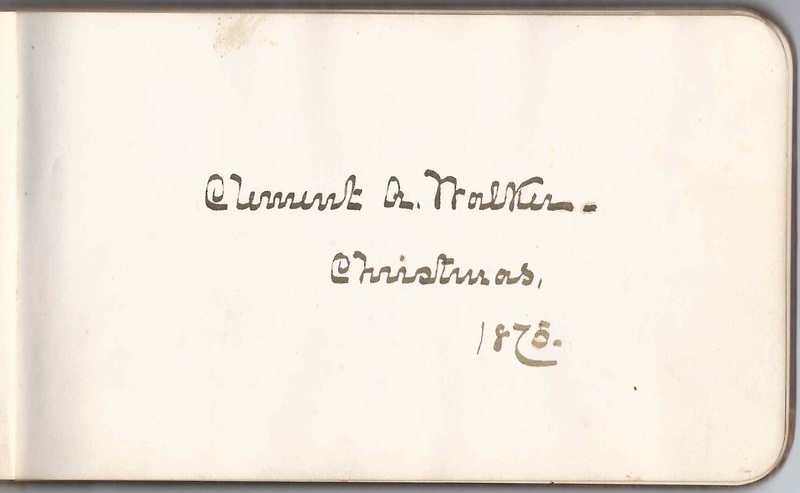 Dr. Clement Adams Walker, Sr., signed the first page in the album after the title page, on Christmas Day in 1875. It was presumably he who gifted the album to his son. Dr. Walker served for thirty years as head of the Boston Lunatic Hospital in South Boston, Massachusetts. Read more about Dr. Walker and how conditions vastly improved during his administration, here. 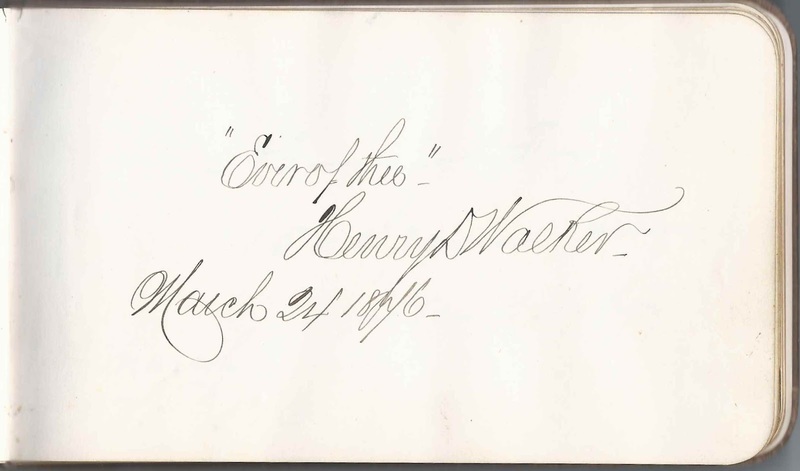 Dr. Clement Adams Walker's brother, Henry Durgin Walker, signed a page in the album on March 24, 1876. Based on the several signers who indicated they were students at B.L.S., I believe that Clement Adams Walker, Jr., also attended B.L.S., which was presumably Boston Latin School. 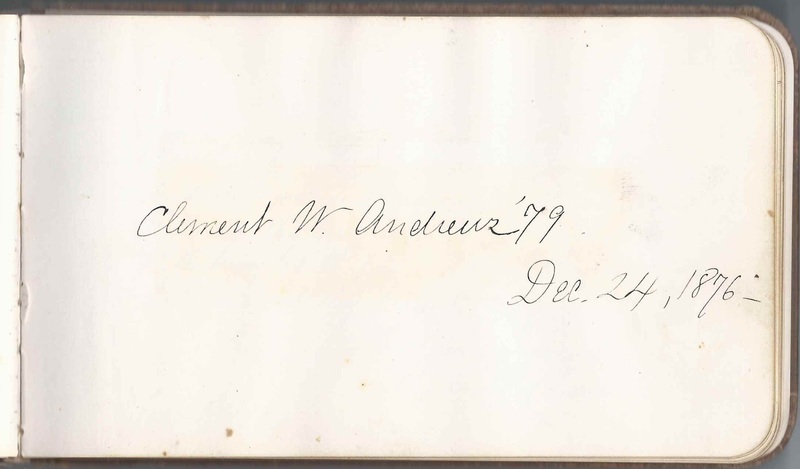 One student, Clement W. Andrews, who signed his page on December 24, 1876, gave his graduating year as 1879. Another B.L.S. 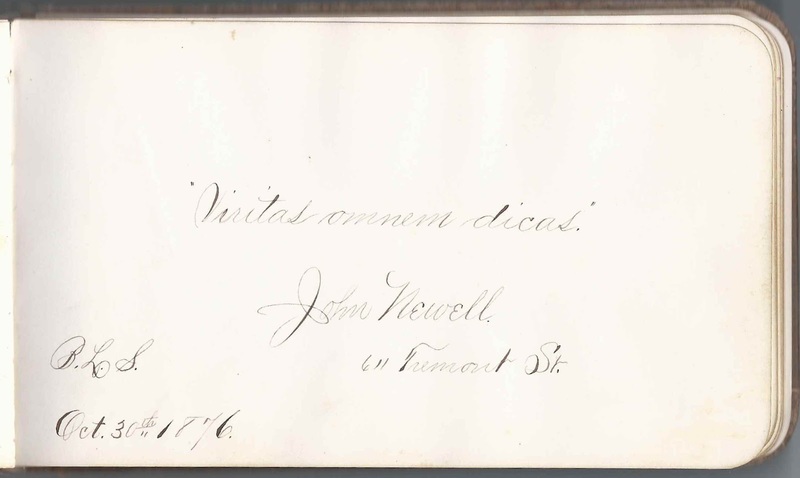 student was John Newell of 611 Tremont Street, Boston, Massachusetts, who signed his page on October 30, 1876. 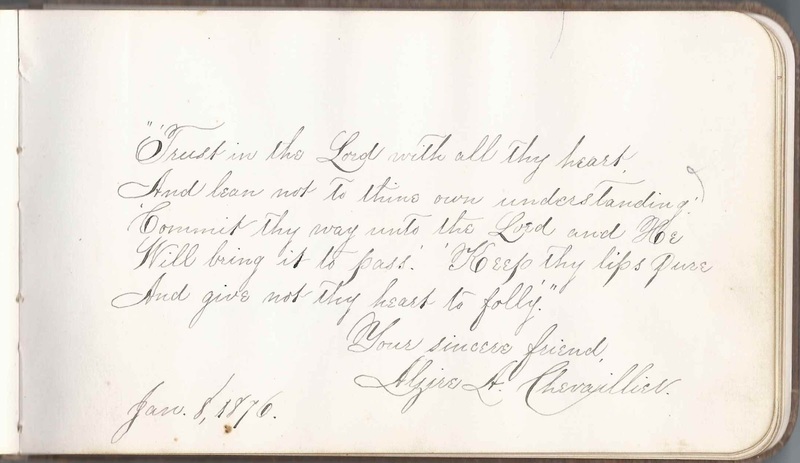 Another page was signed by a student whose name was, I think, H. B. Hix of Rockland, Maine, signed on February 18, 1876. Clement Adams Walker, Jr. married Elizabeth Lynch at Philadelphia, Pennsylvania, on 8 December 1897. I'm not sure if they had any children. They lived at Philadelphia, where Clement worked as a clerk. By 1930, Elizabeth had died, and Clement was living with his mother-in-law Tamar Hall at Philadelphia. Several interesting people signed pages in young Clement's album. Alzire A. Chevaillier, signed a page on January 8, 1876. She was a, suffragist, professional muckraker and, according to some, agitator. She was hired by the San Francisco Chronicle to infiltrate the utopian "Fountaingrove" settlement at Santa Rosa, in 1891. After a few months undercover, she cast aspersions on the character of Thomas Lake Harris and got him tossed out of Fountaingrove, which he had started in 1875. Alzire's parents were Jean Charles Chevaillier of France and his wife Sarah Conant (Clark) Chevaillier, who was born in Boston. 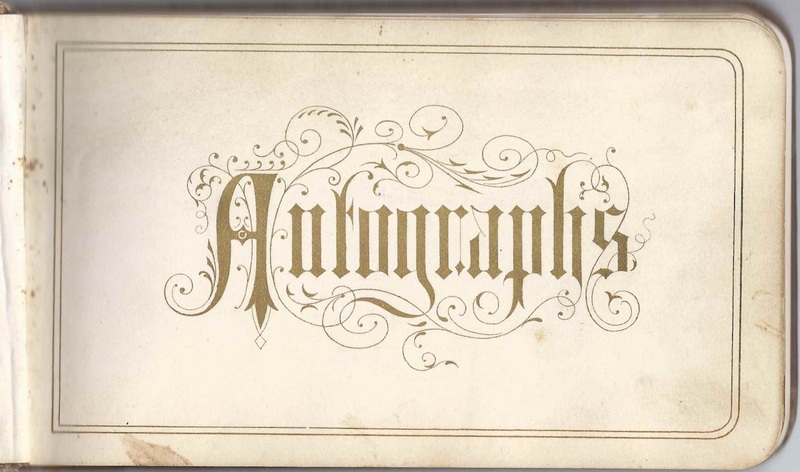 A. Goodrich Fay of 156 Second Avenue, New York, signed a page on March 26, 1876. He was Alonzo Goodrich Fay, an attorney who was the husband of Harriet Amanda (Ransom) Fay. 156 Second Avenue was known as the Ransom House, which over time became the Cafe Boulevard, a famous Hungarian restaurant. 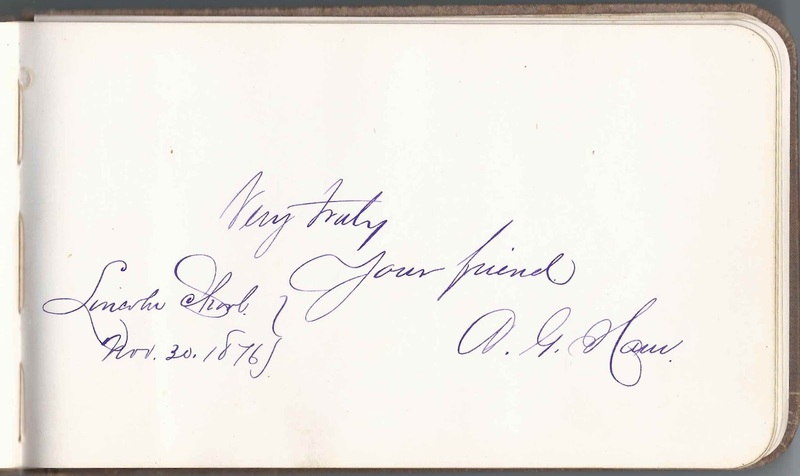 A. G. Ham signed a page at the Lincoln School on November 30, 1876. He was Alonzo Garcelon Ham, master of the Lincoln School. Two Alonzo G.'s in a row, but apparently unrelated. 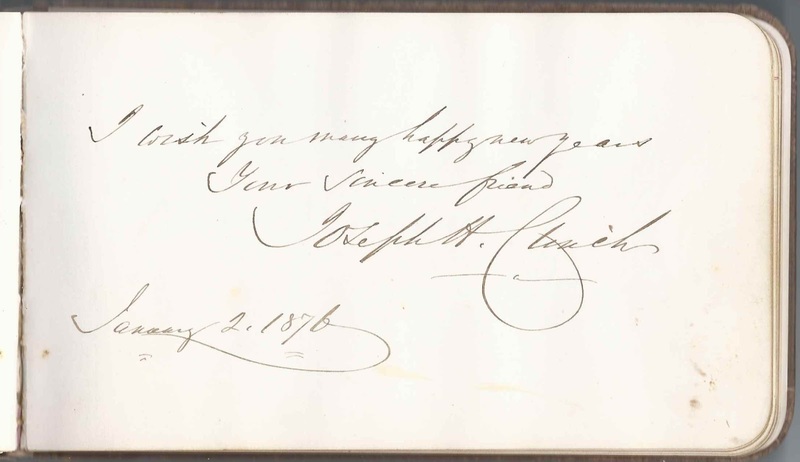 Joseph H. Clinch signed a page on January 2, 1876. He may have been Rev. Joseph Hart Clinch, D.D. J. T. Carter of Wheeling, West Virginia, signed on December 25, 1875. B.L.H., presumably Boston Latin High School. I wonder if he was the son of Dr. John T. Carter, who was associated with Boston Hospital in 1875. Alzire A. Chevaillier, signed on January 8, 1876; Christian Scientist, suffragist, professional muckraker and, according to some, agitator. Hired by the San Francisco Chronicle to infiltrate the utipian "Fountaingrove" at Santa Rosa, in 1891, she cast aspersions on the character of Thomas Lake Harris and got him tossed out of the commune he had started in 1875. Her parents were Jean Charles Chevaillier of France and his wife Sarah Conant (Clark) Chevaillier, who was born in Boston. Joseph H. Clinch, signed on January 2, 1876. Presumably Rev. Joseph Hart Clinch, D.D. 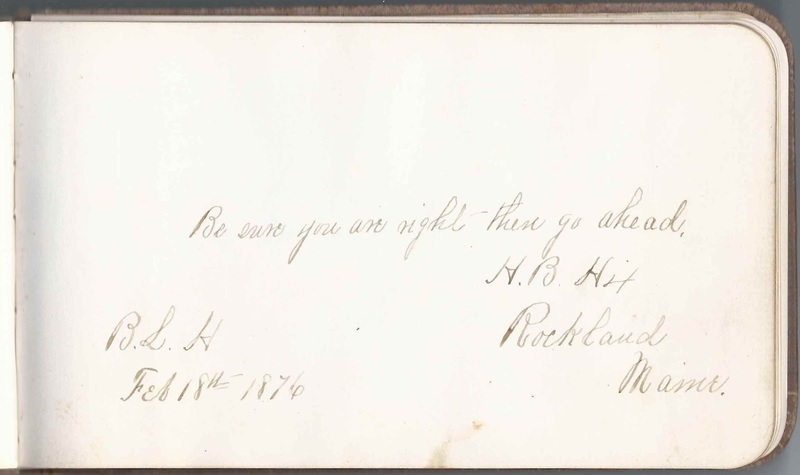 H. B. Hix of Rockland, Maine, signed on February 18, 1876 at B.L.H., presumably Boston Latin High School. Willie B. Merrill of West Roxbury, Massachusetts, signed on February 21, 1877. "W.B. "; "Fables"
E. H. Nichols of Reading, Massachusetts, signed on February 21, 1877, at B.L.S., presumably Boston Latin School. Herbert C. Talbot of Jamaica Plain, Massachusetts, signed on February 21, 1877. "Public Reading"; "Old Keetel"
Clement A. Walker, Jr., Christmas 1875. He was Clement Adams Walker, Jr., son of Dr. Clement Adams Walker and Georgiana (Nichols) Walker of Boston, Massachusetts. 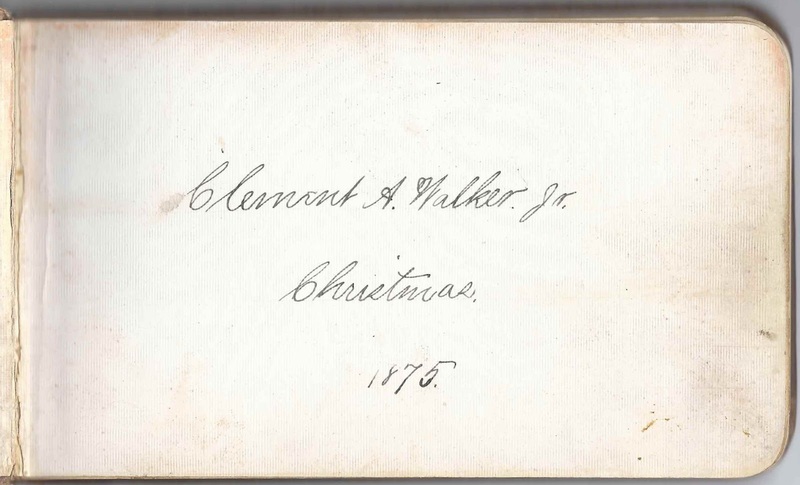 Clement A. Walker, signed at Christmas in 1875. He was the album owner's father, Dr. Clement Adams Walker, who presumably gifted the album to his son. Henry D. Walker, signed on March 24, 1876. He was Henry Durgin Walker, a brother to the album owner's father, Dr. Clement Adams Walker.